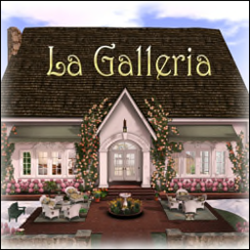 Yesterday, Krys Vita, the designer and owner of the lovely and seasonal Kaleidoscope, announced that the sim will be closing its doors this weekend, mostly likely on Sunday afternoon. "I want to thank all of you for all of the support, love, laughs and pics you've given me — but, like all good things, it's time to close the doors to Kaleidoscope and find new exciting adventures," she posted in her notice on Flickr. 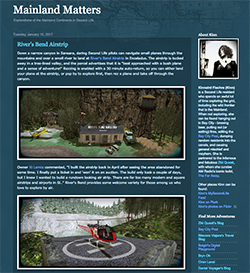 The sim was last featured in this blog when it was winter (read here), but now summer has arrived, and the sandy island is home to shady trees, cozy dwellings, quiet beaches and sea birds that drift overhead. It's a beautiful place to wander, feel the breeze, and to take in the panoramic views. For extra fun, rez a scooter near the photobooth and gas station, and ride it around the region. Kaleidoscope is now bathed in a calm blue, shown in these images, but many other windlight settings will bring it to life as well. Thanks to Krys for having shared her sim with the community.